INTERVEW on Liberty.me studios The Importance of Being a Bunburyist airs on Alabama Public Radio with host and self-proclaimed Wilde enthusiast Joey Clark, and fellow guest/cast member Nathan Hosner from Alabama Shakespeare's production of The importance of Being Earnest. Yesterday's table read, revealed with surprising clarity an examination of the links between generosity, happiness, greed and misanthropy that was both moving and hilariously humanistic. Cavander's treatment of "Timon" elegantly unpacks and updates some of the denser, antiquated language, while managing to preserve original text where possible; moreover, he rearranges certain of the play's scenes giving perhaps even better expression of the story's original intent. Regardless of what purists will have to say in response, it's easy to imagine the original authors taking not umbrage but delight at the vigorous attention their script is receiving. In any event, our production with Geoffrey Sherman at the helm, Anthony Cochrane starring as TIMON and supporting cast of the tried and true promises to blow Alabama audiences away! CO-STARRING in episode 6 of Steven Soderbergh's The Knick - HBO and Cinemax. JOINED THE REP COMPANY of Alabama Shakespeare Festival's 2014 Season as NICK CARRAWAY in The Great Gatsby and HORTENSIO in The Taming of the Shrew and POET / HORTENSIUS in Timon of Athens. OPENING NIGHT of "Sorta Like Julie...Only Worse" in the MITF playing JULIE's boyfriend MITCH, directed by Kelly Hutchinson. REHEARSING Julie Hays' teleplay "Sort of Like Julie" getting a live action read at The Gershwin Hotel on March 5th at 8:00p! Playing the role of a wry, interactive TV CAMERA embodied as an old school Hugh Laurie style narrator. The project is also being developed for the NY theatre festival circuit. FUNDRAISING, Sourcing/Interviewing editors for "Waking Marshall Walker" post. STARRING with Jordan Dann, et al. in another James Ford-Hutchinson/Jennifer Bowen short, directed by JFH, shooting in January. Back to NYC after wrapping "Waking Marshall Walker" and a rewarding week of production and shooting in Mariposa, California with across-the-board talent behind and in front of the camera. 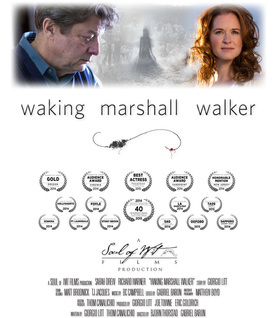 CO-DIRECTING a short film with Gabriel Baron entitled Waking Marshall Walker. Written by fellow Yellow Leaf Co-Star Giorgio Litt and Thom Canalichio. The film stars Sarah Drew (Grey's Anatomy) and Richard Warner (Spielberg's Lincoln), is currently in pre-production and shoots on The Chappell Vineyard in Mariposa, CA in November, 2012.